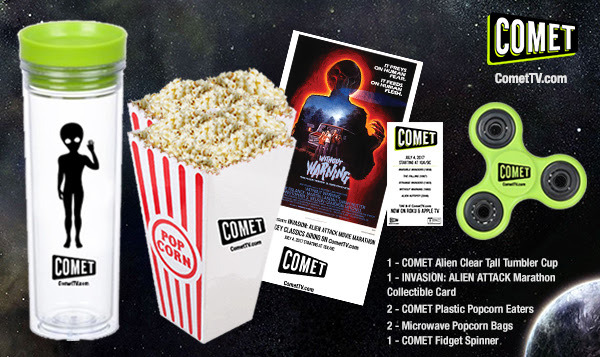 We’ve partnered with COMET TV to offer a giveaway: the Alien Attack Movie Marathon Prize Pack! One winner will receive one prize package including the items listed below (winner selected randomly). Enter by midnight July 9, 2017 using the Rafflecopter form below (U.S. only, must 18 or over, no P.O. boxes). This July marks the 70th anniversary of the mysterious UFO crash at Roswell, and COMET is going all out to celebrate. On July 4, we’ll be airing our Invasion: Alien Attack Movie Marathonbeginning at 10am/9C. Each household is only eligible to win COMET TV Alien Attack Movie Marathon Prize Pack via blog reviews and giveaways. Only one entrant per mailing address per giveaway. If you have won the same prize on another blog, you will not be eligible to win it again. Winner is subject to eligibility verification.